When we #imagineBRT, we often focus on being able to ride our bikes from the Cape Cod Canal all the way to Woods Hole. But, imagine being able to ride your bike across the entire Cape. 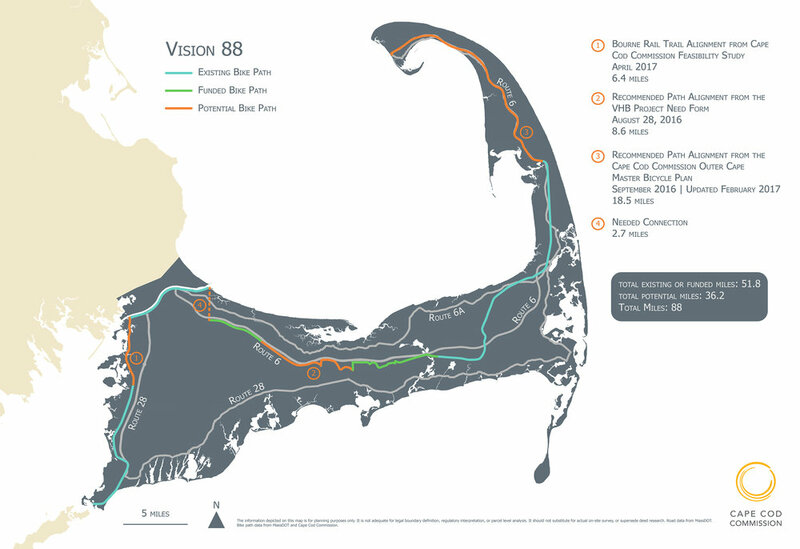 Vision 88, dubbed by the Cape Cod Commission to represent the total number of miles of paths and trails, is a Cape-wide initiative working to develop a network of paths that would run from Woods Holes to Provincetown. And while the Bourne Rail Trail is the critical link the Cape Cod Canal and Shining Sea Bikeway of Falmouth, there are a number of other potential paths being developed all across the Cape. As an organization, the Friends are dedicated to promoting other Cape Cod and Massachusetts based bikeway and pedestrian projects. Below is a list of links offering more information on fellow bike path projects across Cape Cod.